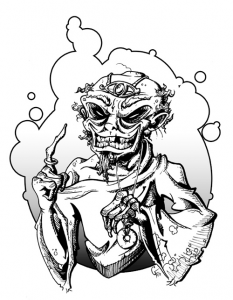 The Mad Archwizard (aka the Insane Sorcerer) is probably one of fantasy roleplaying games’ most used villain archetype. 90% of the world’s dungeons have been excavated and populated by these nefarious personalities. Many have turned to the cold embrace of undeath to continue their magical studies, picking up the Lich template. Just as many (if not more) become victims of their success as some rare magic they have just discovered ends their mad obsession with obtaining arcane lore. The trick is spinning the cliché into something new and original. Once again, I would like to thank Crystal Frasier for providing the fantastic illustration accompanying this article. Look for her work in an upcoming issue of Kobold Quarterly (I hope I can say that!). The Arcane Academy has been around for around five hundred years and has a tradition of changing headmasters every fifty years. Xephero is the tenth such headmaster, who has all had a reputation for being loony, but commanding a large measure of loyalty from his students. In fact, no student to date has ever spoken about their time at the academy, merely stating that if one wants to know more they should apply with the headmaster. The truth of the matter is that Xephero is actually the founding headmaster and is over five hundred years old. Xephero has gone by many names, but he often reverts back to his original given name which he claims currently. Xephero created the Academy because during his obsessive search for arcane power, he became cursed by the patron deity of magic. Xephero had reached what he considered the pinnacle of mortal achievement in the studies of Arcane Lore. Not one spell, ritual, or tome had escaped his research. So he prepared an ancient ritual for communing with the gods, thinking to impress the deity of magic. You shall truly be known as the greatest wizardly instructor of the Art, for you shall be compelled to instill your vast knowledge upon any apprentice who seeks it. You shall never be able to expand your precious knowledge, only share what you have learned thus far. This shall be your fate until the Prodigy surpasses your achievements in the Art. Xephero is under divine geas to teach anyone who wishes to learn from him, but he makes an effort to seek out the most talented apprentices in the land to enroll in his Academy. By doing so, he hopes to discover the prodigy destined to surpass him. Every generation, he chooses his most promising student to become the next headmaster. Then during a secret ritual, he traps the soul of the student in a crystal and possesses the student’s body, thus preventing anyone from surpassing his achievements. When a student signs the application for enrollment, she is magically bound to defend Xephero from all threats while attending the Academy as well as being sworn to secrecy about anything she learns or hears within its walls. With the magical contracts, Xephero hopes to ensure his continued existence free from external peril. The life of a student of the Academy is harsh and full of work. Xephero pushes the students to their limits and his motivation is twofold. One, since he can no longer expand his arcane knowledge, he uses the students’ discoveries to increase his powers, though he has been unsuccessful at reproducing any student discoveries. Two, he actually tries to make the students’ life as miserable as possible so they will quit and leave the Academy, keeping him from having to share his knowledge. The Arcane Academy is home for anywhere from ten to twenty students at any time. The turnover rate is quite high, as not many students have the determination to subject themselves to the rigors that Xephero puts them through. Because of the contract, they are all required to defend Xephero to the death should any aggressors attack the mad Archwizard. They are all wizards ranging from level 1 to 25. Also, the contract swears them to secrecy, even after quitting the school, which leaves much mystery to anyone requiring knowledge of the interior or inner workings of the Academy. The only way to free the students from being bound by the contracts is to find them and dissolve them with acid. Once the contracts are dissolved, students will be governed by their own free will, which could mean they might defend Xephero out of self interest. The mother of an apprentice of the Academy, a noblewoman who serves as a priestess of the goddess of healing, has been receiving visions about her son. In her vision, her son has been imprisoned in a cage of glass. All of her correspondence goes unanswered from the Academy, and she fears the worst. A power artifact is rumored to be held by an elder black dragon in the swamps to the south. A band of worthy heroes are being sought to recover the Quill of Fate before the dragon discovers its fate and uses it. The ancient relic is supposedly capable of rewriting one’s fate should he know what his destiny truly is. The Arcane Academy is willing to store and protect the artifact. The player characters are in need of a rare ritual to cure a deadly disease. They have heard the Arcane Academy houses much lore and may have the ritual in question, but the headmaster requires enrollment.